Quoting “the Loudness Wars’ I thought was in reference to the You tube piece with the same name. Here’s a simple example: Rip ‘Counting Crows , August and Everything After’ into audacity or Audition, and look at the waveform. It’s clipped in the digital domain, which means horrendous distortion, and it sounds thin , compressed, un-dynamic, and uncomfortable. Fortunately, there is an element of maturity creeping into digital domain re editing, and although vinyl is my first choice ( YES, I’ve got Counting Crows AaEA on vinyl 🙂 ) some of the vinyl releases of stuff re engineered in the digital domain are actually credible. ‘Hi Fi is my Hobby. Music is my Passion’ :- forthcoming ‘T’ shirt from , well, me. Does a higher source level let you run your amp at a lower wattage setting, there by producing less distortion? I know some people like S.E.T. amps w/ klipsch horns because their low amplification supposedly sounds better. Is this a valid and logical point? I believe the “artists” and music industry in these days of “digital” have tried to substitute technology and volume for talent. In my opinion, dynamic range generally makes a piece more listenable and “real” (if that’s the artists intention – often these days it is not). Compression became a bonafide effect about on or about the Dark Side of the Moon album, and is used by musicans to control the presentation in many cases. In those cases it is used only for short periods, and often only on one track (instrument) to provide balance. It’s use to save space on vinyl is a compromise we should no longer have to make, as space is readily available and cheap on digital mediums. The current trend to make a recording “loud” as described may appeal to a certain mass market group, but does not endear itself to true listeners. Even in the vinyl days, there were entire recordings ruined by it’s overuse. One ELO album comes to mind, can’t remember the name, but I vividly remember to this day my severe disappointment upon cueing it up 25 or so years ago. I hate to see enjoyable works rendered unlistenable by such mistakes in the mastering. I don’t buy a lot of contemporary music for a variety of reasons way off this topic, but it’s sad to hear it’s still a problem. It seems to me that it would be one issue totally solved by modern recording methods, and maybe that is indeed true, and the problem is a desire to make a disc more comercially sucessful. I guess it’s hard to blame them for tryiing to make a disc more comercially profitable, but it hurts our (and admittedly small) demografic of more critical listeners. In the mid 1980s my system was JBL 2404h tweeters, 2425h comp drivers with 2344 horns, 2122 10″ mid-bass drivers with a Dahlquist electronic crossing over to 18″ 2245h bass drivers (These were all 8 ohm drivers). I had a Moscode 300 driving the upper system over 350hz and a Phase Linear 400 driving the 2245h drivers. My Records were mostly Telarc recordings of Kunzel’s Pops and classical recording and some good Jazz and Big Band. I had several occasions where I could take home a battery operated SPL meter with peak responding as well as weighted average digital readouts from the manufacturing company that I worked for. My JBL System had a sensitivity rating of 95db 1 wt-at 1 meter per JBL. 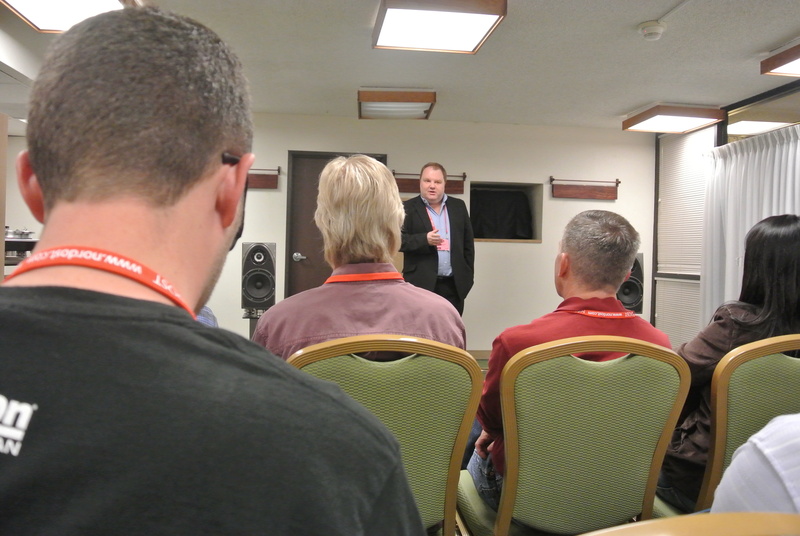 I was generally about 10′-12′ from the speakers in a huge room with a 15′ cathedral ceiling with no 8′ or more walls that were less than 28″ apart ( a relatively dead room). At my listening level I saw peak readings of 115db on most of the higher dynamic Kunzel recordings quit consistently. (Including the War of 1812 recording, and yes the stylus on my Concord 100 cartridge did jump out of the groove) The moral of the story is that with 8 ohm power of 365 watts there was about 3 db of headroom above the “normal” peak dynamic that I was hearing. I considered these peaks as normal to my ears for a good listening session. In college I played in Marching Band, Concert Band, Symphony Orchestra and Basketball Jazz Band at UCLA. I have been to dozens and dozens of performances of the Florida Orchestra over the last 20 years and most were of the very dynamic performances of major romantic period composers. On some occasions my ears have minor irritation on some of the live dynamic peaks. My system today is Innersound Mk III speakers with a sensitivity of 98/db 1wt/1mt. Biamplification of these speakers is roughly the same total power as my old system. As a general rule my “normal” listening level is probably about the same as with my old system. The big difference is the additional 3db of dynamic headroom. I am submitting this reply as it may help some to scale down to other systems and could help them to understand the subject better. I have taken two of my late teenage grandchildren to at least a two dozen of these concerts and we all agree that from our seats ( about 20 rows back) the live sound of the orchestra can get louder than my “normal” peak listening level. We even turn it up to try to get to the same level, but cannot do it with ear irritation. I hope this helps. It’s not just compression and the consequent lack of dynamic range that is a problem. There’s also the mastering. This is almost always tweaked to produce a good result on “average” speakers. Given the overwhelming predominance of cheap, nasty loudspeakers worldwide, that average is a pretty low one. I have even seen cheap, nasty speakers promoted as those typically used in studios for such mastering (as if that was any kind of recommendation). The favoured brands change over time but the principle does not. Makes sense for the industry since more people get a good sound from the music-as-intended, but it means, for instance that the sub-bass heard on a decent system is heavily over-emphasised. I have heard hifi buffs explain their inordinately heavy bass by claiming that it is there in the recording, therefore it is meant to be heard and if down-market listeners can’t hear it, that is because their speakers are deficient. Nonsense. The engineers have tailored the frequency balance to what would be heard from a pair of cheap speakers and what the hifi buff is hearing is not what the engineer would have mastered on a high-end system.To get the recording as it is meant to be heard out of a high-end system is almost impossible; you should certainly start by rolling off the sub-bass, but what else you do at other levels of the frequency spectrum is moot. Finally someone is talking about the loss of the volume control. It’s been driving me nuts for years. A large percentage of today’s recordings are unlistenable. Doesn’t anyone in the recording industry know that? A new recording starts loud with the volume control soft. If you try & turn it up you end up with a harsh glare that will make you wish you were at the dentist’s. So you can’t turn it up & you can’t turn it down (because it’s already down). We’re left with this loud (mostly unenjoyable sound) with the volume hardly on. All the dynamics are gone as well as the fun. This is like taking recording back to the stone (not rolling) age. Fie on the industry. Get in line with the fruit growers on RUINING their product.